Attention ladies: you can sign up for free Craftsy online classes to teach you to make your own drawstring bag and bucket bag. 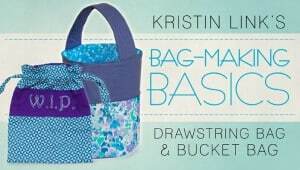 Just register for the free Online Bag Making Basics Class with Kristin Link. Craftsy is also currently offering a free beginners Bag Making Basics where you will learn how to make both Drawstring & Bucket Bags. This one is pretty hot! Make sure you sign up before the registration closes if you’re interested!